Gonstead Chiropractic has a single purpose: To locate and correct vertebral subluxations for the improvement of nerve function. The brain and the nervous system control every muscle and organ in the body. In fact every single cell in your body is controlled and monitored by your nervous system and the slightest interference to this communication can cause health problems and dysfunction. The Gonstead Chiropractor utilises his unique and refined art of spinal analysis to detect any dysfunctional areas of the spine and then begins to specifically correct them, thereby restoring proper nerve function and ultimately, health. When proper nerve function is restored, pain disappears, headaches are gone, stomach and intestinal problems are healed.…maximum health can be achieved. Appreciating the fact that two of the most significant factors for healing are time and opportunity, the Gonstead chiropractor abides by the following motto: “find it, accept it where you find it, fix it and leave it alone”. 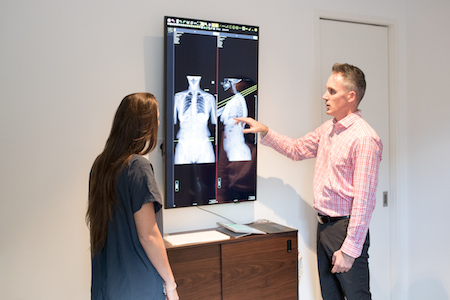 That is to say the goal of the Gonstead chiropractor is to identify the problem, respect the fact that “where it hurts” is often not the site of dysfunction, correct the specific dysfunctional segment and appreciate that all healing takes time. In order for healing to occur, the spine and nerve system need to be working well enough for long enough, for the body and brain to change. That is why regular checks are necessary and the Gonstead chiropractor will perform a complete and thorough assessment every time, ensuring the best and most appropriate chiropractic care. This is what sets Gonstead chiropractic apart from many other chiropractic approaches. Gonstead…There is no substitute when you want the best and most time-tested Chiropractic care available today. If you have questions not answered here, contact us today.